UPDATED on December 7, 2018 to state the correct number of program closures based on new information from HHSC. 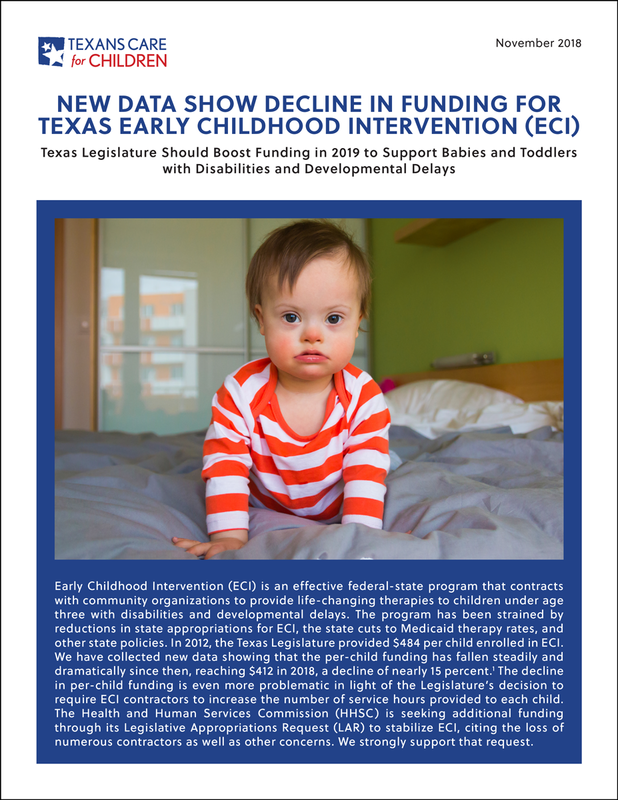 AUSTIN – A new report shows that funding for Texas Early Childhood Intervention (ECI) for babies and toddlers with disabilities and developmental delays has fallen from $484 per child in 2012 to $412 in 2018, a decline of nearly 15 percent. The report by the nonprofit organization Texans Care for Children follows a recent request from state officials to the Legislature to increase ECI funding in 2019 in order to address the unmet need and closure of multiple organizations providing ECI services. The state ECI program contracts with community organizations, such as Easter Seals and Any Baby Can, to provide physical, speech, occupational, and other therapies to children and to educate their parents about how to address their children’s disabilities and developmental delays. The need to restore funding for young children with disabilities has emerged as a high-profile issue in Texas in recent years. Following a public outcry about 2015 state Medicaid cuts for children with disabilities, the Texas House passed legislation to restore the funding during the 2017 special legislative session, but the Senate and Governor did not take up the legislation. Those Medicaid cuts are separate from the ECI funding decline documented in the new Texans Care for Children report, although the Legislature's decisions on both funding streams have been damaging to ECI. The Texans Care for Children report urges the Legislature to support HHSC’s budget request for ECI, which will be considered during the 2019 legislative session. The number of children receiving ECI services in Texas has fallen since 2010, yet the need for services has likely grown as the population of young children increases: average monthly enrollment in ECI has fallen 11 percent since 2010 despite a five percent increase in the state’s population of children under age three. Enrollment fell significantly when the Legislature narrowed eligibility in 2012. It has likely remained low since then because of so many programs shutting down as well as state funding cuts forcing ECI contractors to scale back their “Child Find” outreach efforts. Total ECI enrollment has partially rebounded in recent years. The state cuts affected children of all backgrounds, but there was a disproportionate decline in ECI enrollment among Black children. The U.S. Department of Education began to investigate Texas’ compliance with federal regulations governing Part C of IDEA (called ECI in Texas) in 2016 and conducted a monitoring visit to Texas in August 2017 but has not released its findings yet. Texan Care for Children urges the Department to release its findings as soon as possible.